We Manage With Love celebrates 1 year anniversary with a proper bash. 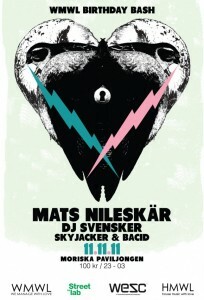 Together with WESC, Streetlab and the eminent Mats Nileskär from Swedish Radio P3 it will be one memorable night on the 11.11.11. As a bonus all guests receive a special 30% discount on all WESC collection at the Streetlab store in Malmoe. Check out all the event info here. This entry was posted in Featured, News and tagged 111111, alex esser, bacid, kubkub, mats nileskär, p3 soul, skyjacker, svensker, WMWL. Bookmark the permalink.